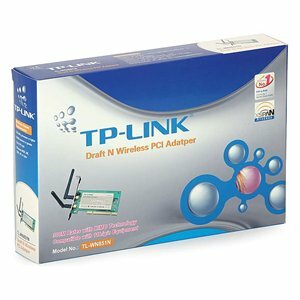 The TL-WN851N Wireless N PCI Adapter complies with IEEE 802.11n, IEEE 802.11g, and IEEE 802.11b standards. Wireless transmission rates can reach up to 300Mbps. The PCI card employs MIMO technology and has two external detachable omni directional antennas providing even better wireless performance, transmission rates, stability and coverage. At the same time, CCA technology automatically avoids channel conflicts using its channel selection feature. This product supports 64/128/152-bit WEP encryptions, as well as WPA/WPA2 and WPA-PSK/WPA2-PSK encryptions and mechanisms in addition to the adapter’s QSS (Quick Secure Setup) feature, allowing users to quickly and easily configure wireless security. This product can also simultaneously operate bandwidth intensive applications such as voice and video. Applications using a lot of bandwidth that are sensitive to interruptions such as voice and video applications are given priority in order to assure quality. It also works well with other 11g and 11n protocol wireless products.